For many years, JNB has expected an increase in scrutiny of conventional treatment for biological and corrosion control from environment and cost reasons. Evaluations have been conducted and proven successful for the implementation of hydrogen peroxide as a total cooling tower treatment. This offers many benefits, not the least of which are cost and environmental impact. JNB Lab's function in this regard is to organize and assess the feasibility of evaluations in this area. The hydrogen peroxide material would be purchased on the open market. 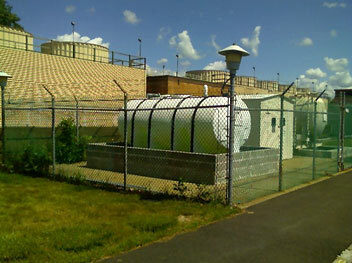 JNB is continuing to evaluate the usage of hydrogen peroxide as a total cooling tower treatment at different facilities with great success. Once a successful trial has been completed, JNB aids in the engineering design and installation of a permanent feed and control system. Permanent feed systems range from simple gravity to pumping systems with building automation integration. JNB is typically involved in limited monitoring capacity, but it is the goal of JNB help facilities understand and manage their own system. Since the only material used is hydrogen peroxide in lieu of many, the monitoring and control are much simpler than conventional programs. After the successful trial in 2007, using totes of 35% hydrogen peroxide, JNB aided the facility in the engineering of a permanent peroxide feed system. The system includes a 2,600-gallon storage tank with I-beam supports mounted over complete containment for safety. The installation also includes a bulk filling station and all other necessary safety measures, eye wash, piping, etc. Since the tank is located higher to sump level, peroxide is fed by simple gravity into the tower sumps. No pumping is necessary. The facility is able to receive bulk deliveries of 50% peroxide and thus save further on chemical costs. This design also eliminates any necessary handling of the peroxide material by operators. This system remains in successful operation to date. 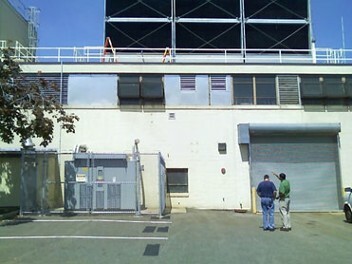 After the successful trial in 2007 at Murray Hill, New Jersey, the Whippany, New Jersey, location ran a trial on their tower sets using peroxide as a total cooling tower treatment. Since the Whippany towers are located on the roof, the option of simple gravity feed was not available. JNB worked with site personnel to engineer a pumping feed system using the returnable, double-walled 375 gallons totes of 35% peroxide. A pumping skid was designed including all necessary safety considerations. The skid was piped up both tower set sumps using a manifold and valving to control tower feed to either tower set. The system is designed with a water purge to ensure no peroxide is left in the feed line after the feed sequence has taken place. These suspended solids were partially due to high amounts of precipitated matter and subsequent difficulty in maintenance of proper biological control. High amounts of necessary halogen biocides, in the past, have also contributed to additional corrosion products in the circulating water. The local sewer authority also has strict requirements on the types of corrosion inhibitors the facility is able to use. Peroxide was a natural fit since it breaks down into water and oxygen and is, by itself, a biocide and corrosion inhibitor. Prior to implementation of a peroxide program, JNB worked with site personnel to ensure the partial softening of the makeup water was operational. This helped the facility to maintain a lower LSI in the tower system and decreased some of the suspended matter in the towers. Even with some suspended matter in the system, the peroxide has maintained biological control of the towers to <100 CFU/ml for bacteria consistently since installation. Keeping the tower essentially sterile, eliminates biological deposits and under-deposit corrosion. Scale adhesion to tower surfaces is also eliminated since no biological slime is allowed to form on system surfaces. Even with some of the challenges at this installation, corrosion rates for mild steel and galvanized coupons have been excellent at 2.00 mils per year and 0.02 mils per year on copper. Due to the success of peroxide usage for total cooling tower treatment at other locations, a major research and development facility in New Jersey decided to use peroxide on a new tower set installation. The tower set for this installation has small Marley packaged units. The towers are two (2) units at 250 tons each. 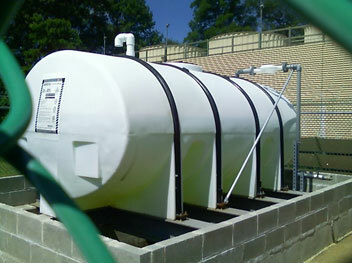 The peroxide storage tank for the installation is 360 gallon, double-walled, linear polyethylene and capable of receiving bulk delivery of 50% peroxide. JNB ensured all necessary safety measures have been employed in this design. It is estimated this tank should only need to be refilled 1-2 timers per year. The tank has been installed just above the sump level in the towers to enable simple gravity feed of peroxide. 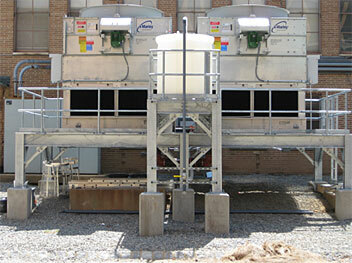 JNB monitors tower chemistry, performs biological monitoring, and runs corrosion coupon studies for this towers set. The biological portion of this tower is typically <100 CFU/ml or near sterile.